Kick Off at the All-You-Can-Eat Buffet on Monday from 4:30 - 8. $1 from every adult buffet goes to the fundraiser with flyer. 20% of your purchase goes to the fundraiser Tuesday - Thursday with the flyer. Beavercreek High School Marching Band & Color Guard Fundraiser April 15 – 18 at Beavercreek Pizza Dive. 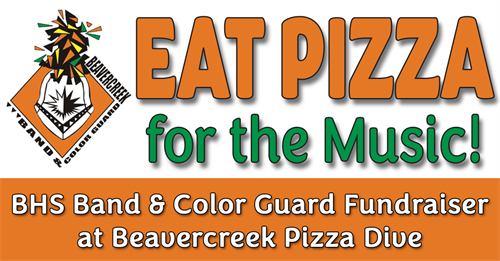 Show your support for the award-winning Beavercreek High School Band & Color Guard and help the Beavercreek Music Parents Association raise some dough when you eat pizza April 15 – 18 at Beavercreek Pizza Dive. Come to the Fundraiser Kick-Off at the All-You-Can-Eat Buffet on Monday, April 15 from 4:30 to 8:00. Beavercreek Music Parents Association volunteers will be your celebrity servers at the Fundraiser Kick-Off. $1 from every Adult Buffet purchase goes to the fundraiser when you bring the flyer. Click here to get and print the flyer. Eat pizza Tuesday, April 16 – Thursday, April 18 and 20% of your purchase goes to the fundraiser when you bring the flyer. – Join the Email List (plus, we send you a freebie just for joining). – Like our page on Facebook. – Follow us on Instagram. – Follow us on Twitter. Do them all and you’ll raise an extra $2 for the fundraiser. Come out, come hungry, come eat some pizza, and come raise some dough for the Band & Color Guard. See you tonight at The Dive.